I have a theory about mankind’s interaction with nature. It’s a little odd, with no scientific evidence whatsoever to back it up. So I’ve never told many people about it, lest they think I’m some sort of crazy, tree-hugging animal rights activist (which, of course, I am). But it’s the only explanation I’ve been able to come up with for why we have so many rare wildlife encounters on our travels. 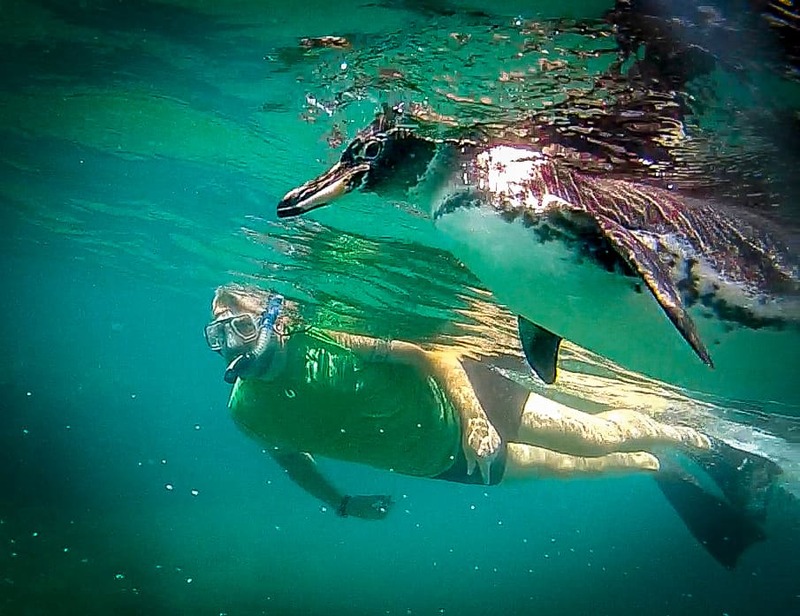 It’s the only way to explain why I got a chance to spend a half-hour swimming with Galapagos Penguins (the world’s rarest penguin species) less than 15 minutes after telling our guide that was my dream. My theory is this: Animals have an innate ability to sense human emotions and intentions. When we approach them with fear, trepidation or aggression (i.e. negative energy), their instinctual response is fight or flight. But when we approach them with respect, admiration, and cautious curiosity (i.e. positive energy), they tend to find humans profoundly fascinating. This approach has led us to have remarkable animal encounters all around the world. We’ve had memorable moments with Elephants in Tanzania’s national parks; Monitor Lizards in Coron, Palawan; and countless Costa Rican animals. Time after time, for whatever reason, wild animals have chosen to come closer to us. 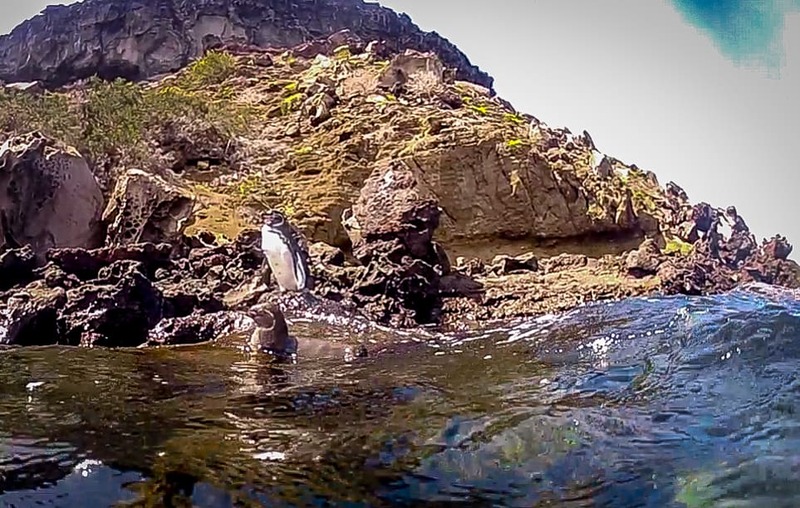 But our extraordinary experience swimming with Galapagos Penguins was special because it was so incredibly rare. How rare? Our International Expeditions guide, Cristina Rivadeneira, said she’d never seen anything like it before in 19 years of working in the Galapagos Islands. 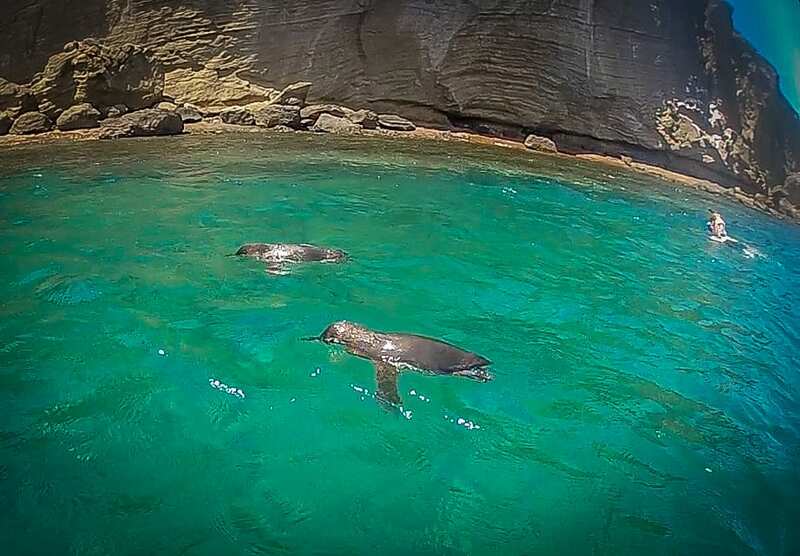 Along with Cape Town, South Africa and Oamaru Harbor, New Zealand, the Galapagos Islands is one of the few places in the world where you actually have a chance to swim with Penguins. They’re primarily found on the western islands of Fernandina and Isabela. But you can occasionally find small Galapagos Penguin populations on Bartolomé, Floreana, northern Santa Cruz, and Santiago Island. They’re the only penguin species known to venture north of the equator. Measuring around 19 inches long and weighing just five pounds, the Galapagos Penguin is the second smallest penguin species in the world. Scientists believe that at some point their Antarctica-based ancestors got caught in the powerful Humboldt Current and wound up in the Galapagos. There, they genetically adapted to the heat (which ranges from 59º-82ºF on average) over time. 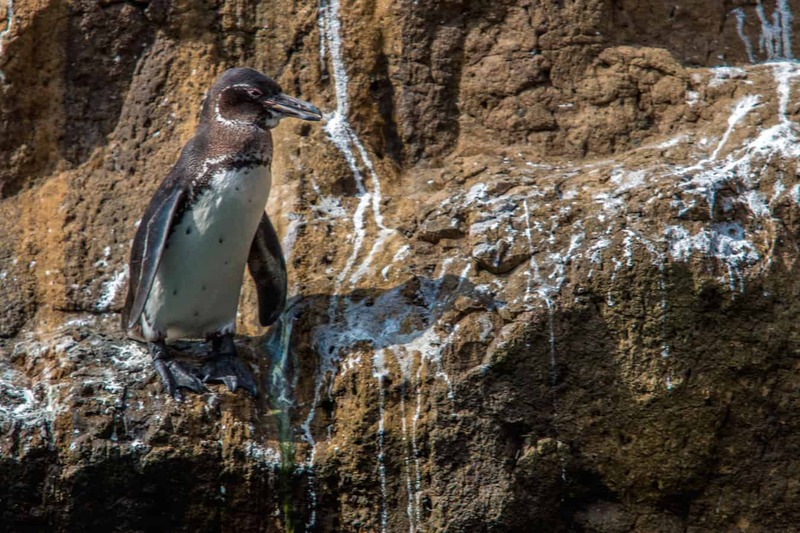 Mating for life, Galapagos Penguins typically nest between May and January, laying one or two eggs in caves and crevices protected from direct sunlight. The nests are usually located within 150 feet of the water, with one parent guarding the egg while the other goes off to feed. The penguins cool themselves by using thermoregulation, stretching out their flippers, hunching forward to keep the sun from burning their feet, and panting to cool themselves. They can typically be found on the jagged rocks right by the shore, relishing frequent dips in the surprisingly cool waters, where they feed on small schooling fish (mullet, sardines, crustaceans) brought by the nutrient-rich Cromwell Current. Their predators are many, including snakes, rats, hawks and owls on land, and sharks, fur seals and sea lions in the water. They occasionally get stuck in fishermens’ nets as well. Thus they’re extremely endangered, with less than 1,000 breeding pairs left and a total estimated population of around 1,500 individuals. Despite their low population levels, seeing penguins in the Galapagos Islands isn’t all that difficult. We saw them virtually every day, usually hanging out on the rocks near the water in numbers ranging from one to five. But swimming with them? That’s a different story. I came close during our 2011 small-ship cruise, when we saw two different mating pairs. I was the first of our group to back-flip off our Zodiac into the shockingly frigid waters of Isabela Island‘s Tagus Cove. I snorkeled towards the shore just in time to briefly see one Galapagos Penguin jetting beneath the waves like a flipper-powered torpedo. And just like that, he was gone. On day three of our International Expeditions cruise last year, my daughter and I spotted another one from a distance while snorkeling the waters of Isabela’s Urbina Bay. 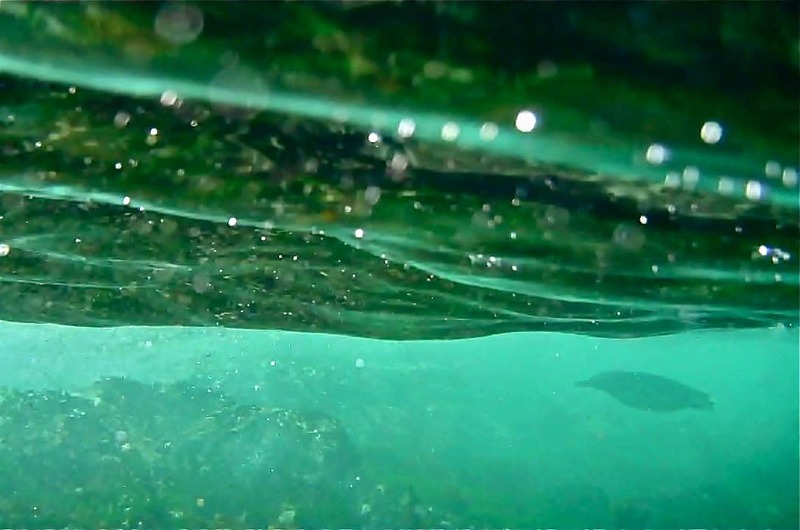 But it disappeared into the deep long before we got anywhere near our GoPro’s range. 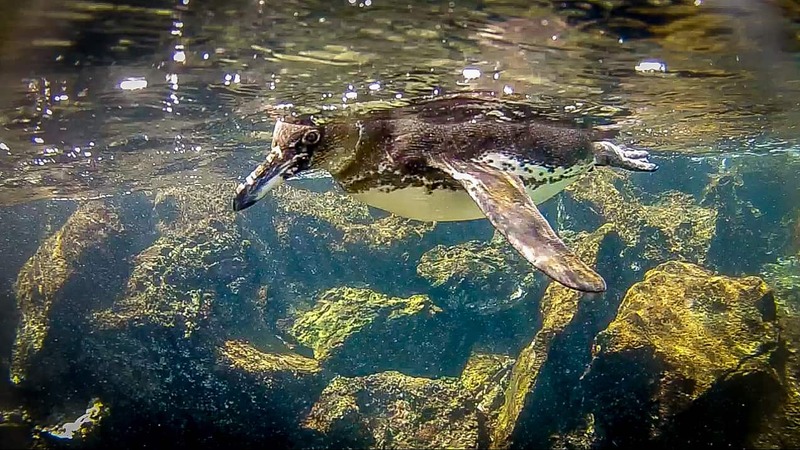 When Cristina asked our group what we were most looking forward to seeing in the Galapagos, I told her how desperately I wanted to swim with Galapagos Penguins. 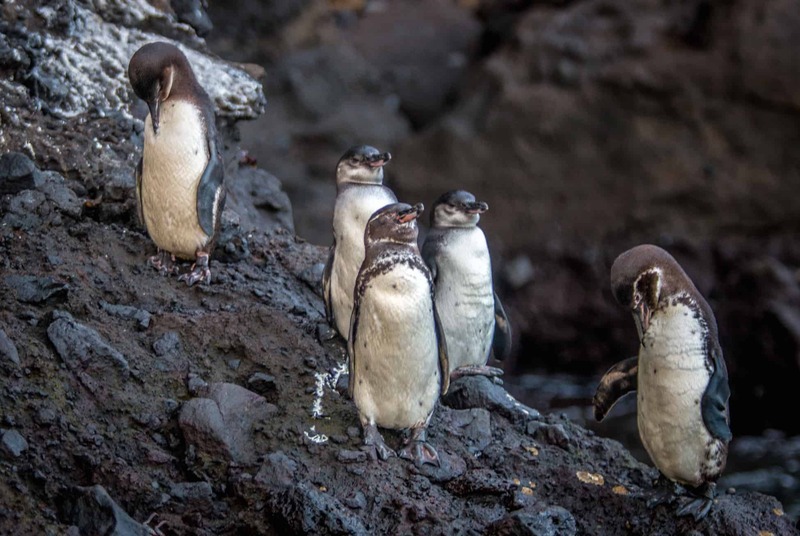 By day four, odds of seeing my dream come true dropped considerably: 90% of the world’s Galapagos Penguins are found on Isabela and Fernandina. By this point our ship (the M/V Evolution) had moved on to Bartolomé Island, which is famous for its distinctive landmark, Pinnacle Rock. My daughter wasn’t feeling well, so we skipped the morning volcano climb. I regretfully left her under the ship’s doctor’s care to do the 10:15 AM snorkel. It was the first time I’d ever left my daughter behind on a trip. We saw a mating pair of Galapagos Penguins in a matter of minutes, standing on the rocks right by the water. But these two didn’t disappear into the ocean. Although there were 9-10 people in our group, Cristina was very mindful that we should approach them cautiously and respectfully. This gave the penguins time to get used to our presence, and gave her time to determine if we were negatively affecting their behavior. Since they showed no signs of annoyance, we were able to get within 6-10 feet with no problem. Since our group was relatively small and there was a large rock effectively splitting the small cove in half, the penguins had plenty of space to escape. There were two young boys, ages 10 and 12, whose parents quickly chided them if they got too close. And since people knew I was shooting video for GGT, they gave me a wide berth, allowing me to keep one side of the penguins’ escape path clear. Since we allowed them time and space to get comfortable, the penguins’ natural curiosity took hold. 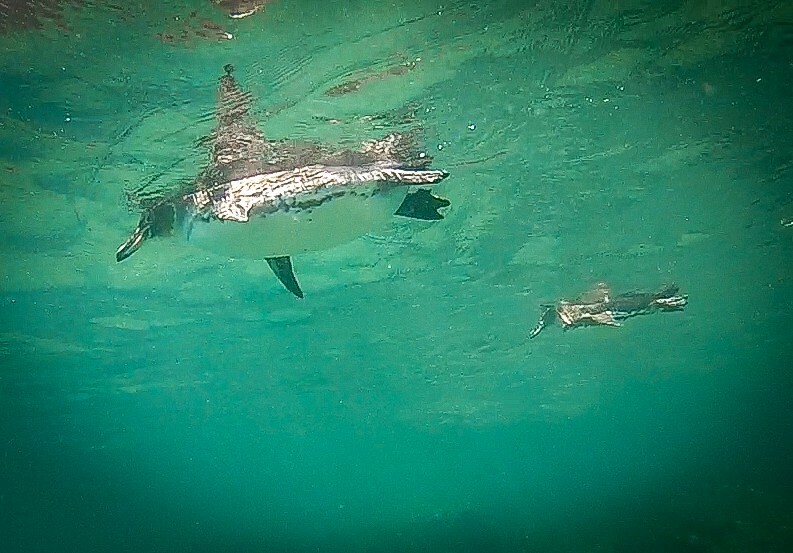 While one stayed put on the rock, the other swam around us slowly, as if to check us out. He took particular interest in my GoPro pole (which has a tiny selfie mirror on it), swimming so close that he almost bumped the camera a few times. Since I’m not generally a big fan of crowds, I tended to stay away from the rest of the group. Rather than swimming towards the penguins, I actually swam away from them and waited to see what they would do. Sure enough, while one of the penguins swam between the kids and dove down, the other hopped in the water and swam to me, swimming around me in lazy circles. Once we realized that the Galapagos Penguins weren’t going anywhere and the initial “HOLY CRAP!! IS THIS REALLY HAPPENING?!? !” factor wore off, I had a crazy thought. What if I slowly swam away from the penguins and then stopped, almost like a dog leading the way through the woods? They swam at a 10º angle from the shore, but I swam parallel to it. They gradually adjusted their path, swimming alongside me about six feet away (see video above)! I could barely contain myself as I handed Cristina the GoPro pole so she could get some footage of me swimming alongside the penguins, which I did for nearly 15 minutes. All in all– from the moment we swam over to their cove to the moment when our Zodiac picked us up to transport us back to the Evolution– we spent nearly 30 delightful minutes with the adorable penguin pair. “How often do you get to do this?” I asked Cristina incredulously as we waited for our turn to climb back into the Zodiac. “Never!” she responded with a broad grin. There’s no way of knowing if my “secrets” for amazing animal encounters actually had anything to do with our amazing penguin encounter. The doubters among you will insist it was sheer luck. Happenstance. A fluke. But I personally believe that the energy we, as individuals, put out into this world comes back to us many times over. Our trip was sponsored by International Expeditions. But our opinions remain our own, and we will never compromise our obligation of integrity to our readers.